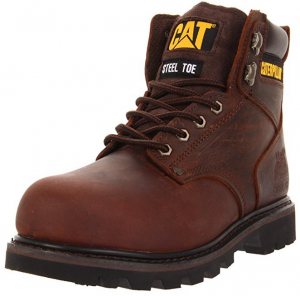 The best steel toe boots should be comfortable and with a perfect fit. They shouldn’t hurt your feet or cramp your toes. But, it all boils down to how well you choose your shoes. Keep the following in mind before you spend money on any pair of work boots for men. You shouldn’t insist on wearing a particular shoe-size more so when it comes to steel toe work boots. Note that various manufacturers size their boots to precise specifications. In essence, this means that a size nine by Timberland may not be the same as a size nine by Keen Utility. And, because you’re making the purchase online, you may want to look at the sizing before you spend your bucks. In most cases, you’re like to come across a statement stating that you should get a pair that’s ½ a size bigger. You shouldn’t gamble with the fitting error when it comes to steel toe shoes for men. Just as the name suggests, the shoe’s front has a steel cap that won’t stretch. As a matter of fact, this is the primary reason most people tend to think that steel toe boots are uncomfortable to wear. As stated, just get a relatively bigger shoe to avoid sore toes. Better yet, irrespective of the size that you choose, your toes aren’t supposed to touch the steel. By design, the best steel toe boots are hard-wearing. They’re the kind of shoes a construction worker or farmer would love to own. However, all safety shoes are not the same. Some are waterproof while others have rubber insulation. Whatever you do, make sure that you choose a pair that best serves your interest. 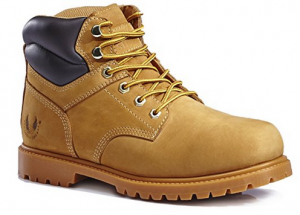 That said, we list down the ten best steel toe boots on the market at the moment. Come with us! We love the GW 1606ST’s full-grain leather, fortified with a durable rubber outsole. The Good Year welt technology ensures that you don’t slip, even when working on a greasy surface. 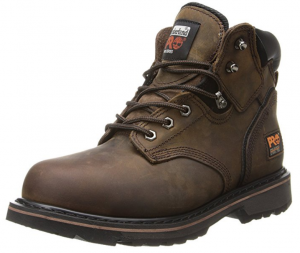 One thing that places these steel toe work boots apart from its competitors is the freshly revamped design. In fact, GW outdid itself on this one and are setting the pace among industry players regarding craftsmanship. Meanwhile, the GW 1606ST comes at a price that won’t hurt your budget. You’ll indeed fall in love with what professes. While the GW 1606ST is a top-notch safety shoe, you may want to be keen with the size when purchasing. Check the fit and as rule of thumb, go with a bigger size, say ½ or 1 size larger. There’s no denying that the GW 1606ST is a fine safety boot for anyone in the pursuit of a little extra protection. It is robust, comfy and ready to wear right out the box! One of KINGSHOW’s most sought after steel toe boots is in a class of its own. It is entirely waterproof and robust, so your feet stay safe all the way. It looks elegant despite the simple design. Meanwhile, the oil-resistant outsole and the premium leather assure nothing short of value for your money. Make no mistake about it, these work boots are supportive, and you can wear them even if you have plantar fasciitis. Now that’s what we call taking comfort to a whole new level! The KINGSHOW steel toe boots don’t have arch support. However, that may not be a downside per se. All you have to do is wear them with inserts and you’ll enjoy a safe day at the construction site. 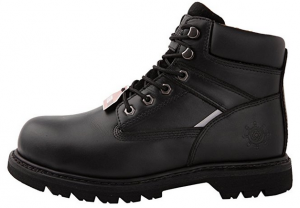 KINGSHOW is synonymous with quality and their steel toe cap boots for men are no different. These boot’s outsole grip is unbeatable, and so is the robustness. They promise five-star performance even in the extreme of conditions. The Skechers Workshire brings forth everything you’d expect from one of the best steel toe boots. Its unique construction assures instant comfort and a roomier fit. The high-grade outer material offers superior protection and strength. And to top it off, this safety boot is in line with ASTM standards for compression and impact. The outsole meets the slip resistant regulation set by Mark II. The Skechers Workshire steel toe boots don’t have the most appealing design. If you’re looking for stylish boots, these may not be your best option. However, they’re working boots and on do an excellent job on that front. The Skechers Workshire boots are relatively affordable, making them an excellent low-budget choice. With the high collar, you can expect added support while keeping water and debris out. It certainly doesn’t get better than Skechers, an award-winning industry leader. Trust Caterpillar when it comes to making rugged, world-class boots. At a glance, this no-frills boot looks simple. But, that shouldn’t fool you – it seeks to serve and protect you. With full-grain leather upper, electrical hazard protection and of course, a steel toe, it has you covered at the farm or on your backpacking trip. Be sure to use the easy-on pull straps for a snug fit. These boots may also double up as everyday wear. There’s no doubt that the Caterpillar Revolver is brilliant steel cap boot, but you may have to wear it with thick socks to prevent the stem from hurting your feet. The Caterpillar Revolver will get you going as part of your protective equipment gear. 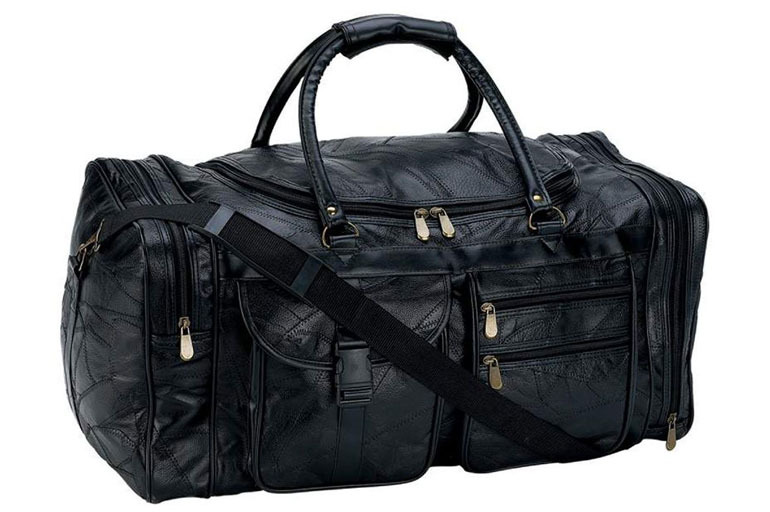 It is agile and sturdy for multi-day trips. If its features are anything to go by, you can expect an impressive performance. Overpower everything in your path from morning due to anything else your workday brings with this innovatively designed safety boot. It boasts KEEN’s patented technology for optimal performance. Top on the list is the breathable membrane for increased airflow. That way, your feet can stay dry all day. The wrap-around outsole covers your toe while keeping you steady even in the messiest of environments. Regarding comfort, the KEEN Utility Pittsburgh men’s steel toe boots, come with a metaatomical footbed that contours to the shape of your feet. If you don’t have a lot of cash to spend, the KEEN Utility Pittsburgh Boot may not be your best bet. The well-thought-out design and the heavy duty construction justify the lofty price tag though. 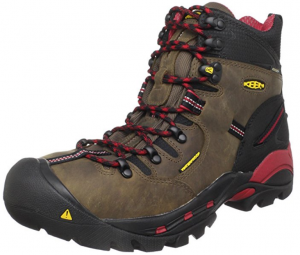 The KEEN Utility Pittsburgh safety boot will serve you, irrespective of your line of work. The lightweight design allows you to wear it for an extended period. If you have any doubts that Caterpillar is a name to reckon, you may want to know what the Second Shift Steel Toe work boot offers. For starters, you can use in any weather or season. Its manufacturer is keen on details, with emphasis on quality and durability. The six-inch lace up shaft and padded collar create a perfect blend of rugged functionality and classic style for virtually any job site. The Caterpillar Second Shift is relatively big (in appearance), but then again, that’s a universal trait in all steel toe boots. Just make sure that you choose the right size. 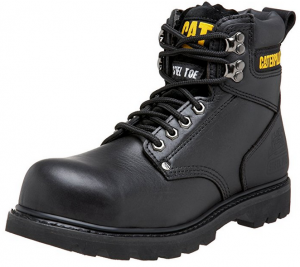 This safety boot is an excellent option for anyone in pursuit of unmatched dexterity and handiness. It is easy to walk around with thanks to the hex-shape grommets that allow you to lace it all the way to the shaft. These boots fit like a glove right off the shelf. They also boast a waterproof and breathable outer, powered by the patented Dry technology. The Atlanta Cool boot’s design allows you to stay safe on any surface, from mountains to beaches and city streets. 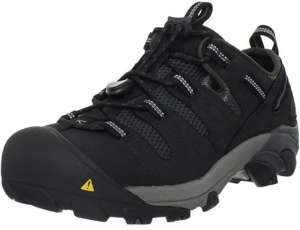 The extra padding and the casual look makes these safety shoes ideal for all day wear. If you’re planning to take a hiking trip soon, these boots rubber outsole will give you the balance you need to surmount the slopes. The Atlanta Cool requires frequent washing to keep its appearance in top form and may not be ideal if you work on a busy construction site. But, you may consider choosing the Shitake shade. If your typical work day involves walking on concrete, the Caterpillar 2nd Shift is the best steel toe work boot for you. This is an excellent do-it-all boot for outdoor and indoor activities. It sports a Climasphere sock liner to safeguard your heels and a slip-resistant outsole for a steady footing every time you step out. 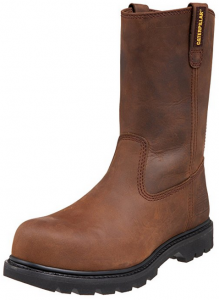 The full grain leather together with the Goodyear welt construction adds agility to this hardworking waterproof boot. Besides, it’s from Caterpillar, the world renowned brand. The Caterpillar 2nd Shift may feel wide at times, especially with a rise in temperatures. When that happens, just use the lacing system to get a tighter fit. You can never go wrong with the CAT’s. 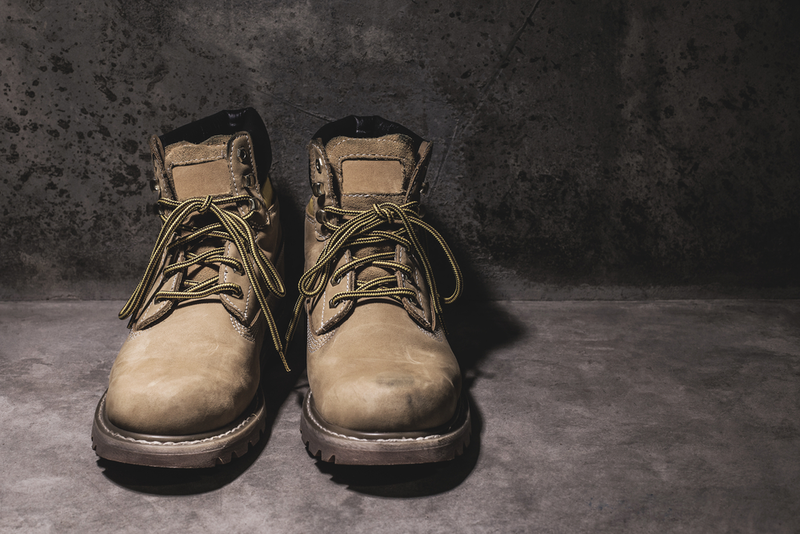 These works boots will give you months upon months of service. You can even wear them during winter when the weather gets a bit chilly. How about that! Adventure-ready is the best way to describe these steel boots for men. They’re akin to your favorite backpacking shoe regarding comfort and stability. The Timberland PRO Direct is waterproof insulated and rugged to keep you going even during extended shifts. It may catch your attention to know that that this boot comes with 400 grams of insulation to keep you warm. The non-marking rubber outsole offers superb traction. And the best part is that the mesh linings and the open-cell polyurethane footbed feature antimicrobial treatment. In effect, they’re resistant to odors. In the meantime, the nylon shock diffusion place promises to keep you rigid when standing. Just like most safety boots, you may have to be careful with the sizing. Again, always order ½ a size larger to keep your toe away from the steel cap. The Timberland PRO Direct oozes first-class performance and could very well be the only safety shoes you need for heavy duty jobs. They are worth it in every sense of the word. 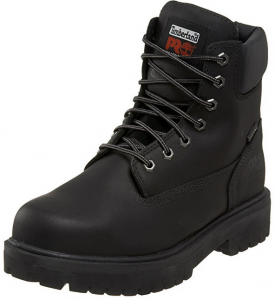 The Timberland PRO Pitboss is one of the best steel toe boots on the market. This pair is everything a man shall look for boots. We are talking about more room for your toes, robust construction, reliability you can count on and superior comfort. The ability to keep you stable is unsurpassed, thanks to the unique traction grip. With the electronic hazard protection, open circuits should be a bother. And to add icing on the cake, the Pitboss meet ANSI regulations for safety. The Pitboss feels a bit heavy, but then again, that doesn’t take away its functionality. Try out the Timberland PRO Pitboss – you’ll love it! And it doesn’t matter if you’re a thru-hiker, avid adventurer or a heavy equipment mechanic, the makers of these shoes, have your needs in mind. The following tidbits will help you get the most out of your safety shoes. Choose a light pair preferably with a polyurethane midsole. The combination of these two factors guarantees increased shock absorption and comfort while you work. A no-slip rubber sole will come in handy when working on a slippery surface so be on the lookout for that as well. Ensure that the sure boots have the necessary safety features. If you work in a nuclear plant, for instance, you could make do with a pair of insoles that can keep static electricity at bay.